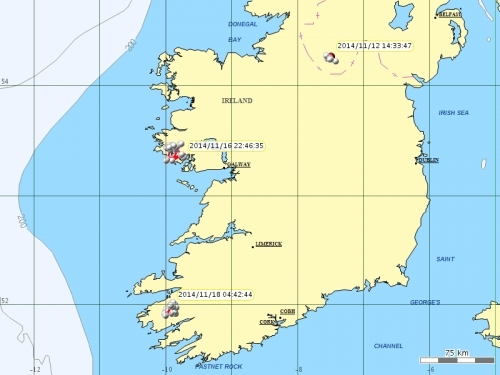 Seems like most or all our adult WTSEs carrying satellite tags have pretty much settled down on territory (not counting the 2014 WTSE chick Aoibheall who has plenty of free time to explore her world for the next 3-4 years of course!). 2009 released male Star found his ‘Des Res’ in a beautiful corner of the Connemara coast in spring 2012, found a mate and nested for the first time this year. Although the pair failed at the point of hatching we’re hoping for big things in 2015. 2009 released male Eddie has had a pretty eventful life too having been found with a broken wing by Kerry farmer John O’Sullivan, rescued and re-released in Killarney National Park in Oct 2012. Funnily enough Eddie has settled only a few km away and within sight of John’s farm (to whom we owe a debt of gratitude!). Also to Currow falconer Pascal Walsh for helping retrain Eddie how to fly! Eddie has yet to breed but like Star we’re hoping he will nest in 2015 having found his own territory on the Iveragh peninsula. 2011 female Zanzi seems to have finally settled ‘next door’ to Eddie on the Iveragh peninsula (on the map of Ireland both Zanzi and Eddie’s range look pretty much the same). She has had her own spell of wandering, spending several months in north Mayo before returning to Kerry. After spending much of the last year ranging all over the Iveragh and Beara peninsulas, the last few months have been settled on Iveragh. At this stage we don’t know if she is as yet paired up or not but time will tell. Partly by chance there is a real shortage of males in the part of south-west Kerry where Zanzi is with at least 4 unpaired females, all of breeding age, in a fairly small area. On the other hand one of our breeding territories just across the Kenmare river on the Beara peninsula is a ‘ménage a trois’ of 2010 female 16 and 2011 males L and M!! Anyone tuning in the latest series of ‘Vikings’ on RTE will know that Scandinavian females are no shrinking violets! !